Ages 7 - 16. Enough information to get started for ages 11+, or perhaps enough in itself for ages 7-11. 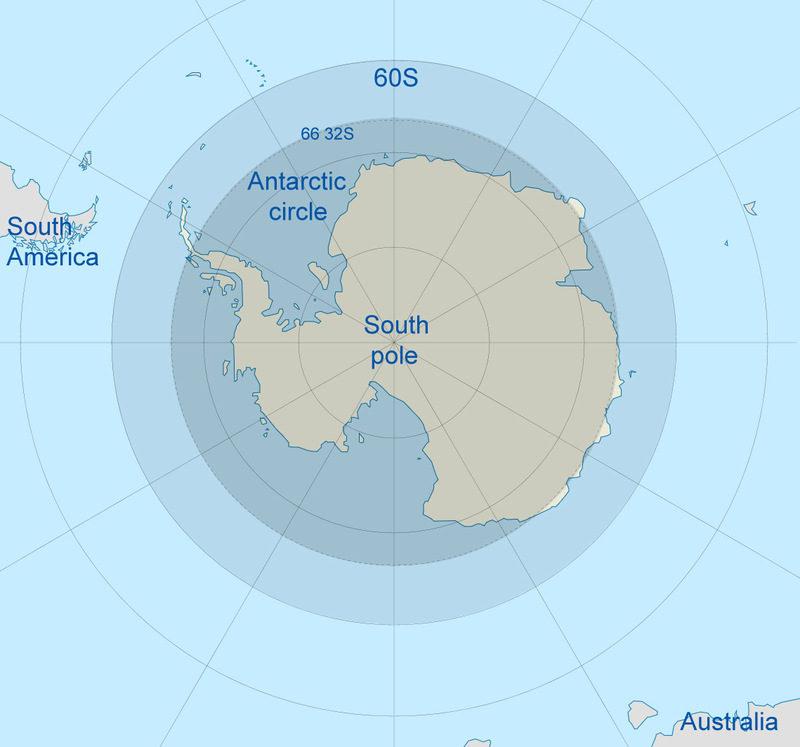 Antarctica is regarded as being the continent of Antarctica, islands and seas south of 60° latitude, it includes the the Antarctic circle, which is an imaginary mapping line at latitude 66° 32' south. It is the area around, and including, the South Pole. The area of Antarctica is 14 million sq km. The winter ice increases its area to 20 - 21 million sq km. Inland temperature averages are lower than coastal temperatures. In winter (May - August) inland temperatures range between -40 to -70 degrees Celsius. Coastal temperatures range between -15 to -30 degrees Celsius. In summer ((December - February) temperatures range between-15 to -35 degrees Celsius. Sub-Antarctic islands may reach 10 degrees Celsius. These are islands which are within the Antarctic region. There are over 40 permanent scientific bases and 100 research stations on Antarctica. The first permanent base to be built was Mawson base which was built by the Australians and opened 1954. Other countries which have built bases in Antarctica include USA, Russia, New Zealand, UK and Germany. Researchers from different countries often work together on many research projects. Antarctica is a very harsh place, and they depend on each other for support and knowledge. Research projects study a whole range of different things such as the wildlife, atmosphere, astronomy, glaciers and ice cover amongst others. The largest land animal in Antarctica is a tiny wingless midge. It is about 13mm long and looks a like a fly. It is too cold for anything larger to live on Antarctica permanently. The birds and other marine animals that come to the Antarctic continent do not spend their whole life there and are not considered land animals. Although there are not many animals on land, there are however plenty in the sea. The animals which live in the sea have special adaptations that make them able to withstand the year round extremely cold temperatures of the Antarctic region. Krill- this is probably the most important marine animal in Antarctica. They look like prawns. Krill form the basis of the Antarctic food chain because they are the main food source of many animals in Antarctica. Baleen whales, which are whales that have no teeth, especially depend on them for food. Squid- are a food source for animals such as seals and birds. There are only two flowering plants which exist in Antarctica. These are the Antarctic spearwort and Antarctic hair grass. Other than these only bacteria, algae, fungi, mosses and lichens exist in Antarctica. Microscopic plants also exist under or even inside rocks, which offer some protection from the extreme temperatures. 1773- James Cook sailed across the Antarctic circle. 1820 - Bellingshausen first sees the Antarctic continent. 1902 - Robert Scott, Edward Wilson and Ernest Shackleton made the first unsuccessful attempt to reach the South Pole. 1909 - Mawson, David and McKay reached the Magnetic South Pole. 1911 - December 14, Roald Amundsen's party reached the South Pole. 1912 - January 18, Scott's party reached the South Pole to find that Amundsen's team had beaten them by about one month. March 1912 - Scott's entire party died on the way back from the South Pole. 1929 - Richard Byrd flew over the South Pole. 1959 - Antarctica Treaty was signed. 1994- Antarctic waters are declared a whale reserve to limit whaling and help preserve whale numbers. There are some countries which have already made a territorial claim in Antarctica. These are Australia, New Zealand, Argentina, Chile, France, Norway and the United Kingdom. The USA and Russia have not made any claims but they have reserved that right, even though they have research bases there. A glacier is a large mass of ice which moves slowly down a mountain. Sometimes these are also called ice rivers. The largest include the Lambert, Mellop, Byrd, Farrar, Slessor, Recovery, Hatherton, Filchner, Ronne, Mulock, Nimrod, Beardmore, Shackleton, Scott and Amundsen glaciers. The longest glacier is Lambert which is 400km long. An ice shelf is a floating sheet of ice which has left the land and is now floating, but is still attached to ice on the land from where it came. The largest ice shelves are the Amery, Ross, George VI, Ekstrom, Filchner and Ronne. The main Antarctic seas are Weddell, Ross and Bellinghausen. These were named after early Antarctic explorers. Ice - ice is Antarctica's most abundant resource, though it is not terribly useful for much. The ice is so pure that it can be melted down to make drinking water without treatment. Coal - there is evidence of large coal deposits along the coast of Antarctica and through the Transantarctic Mountains. Petroleum - there has been no petroleum exploration on Antarctica. Geologists are only suggesting that there may be any petroleum deposits because they found petroleum in other places which look similar to Antarctica. Mineral Resources - scientists have discovered minerals such as copper, cobalt, iron and nickel in Antarctica. Problems with Resource Exploration - no-one is really interested in mining for resources in Antarctica at the moment because the conditions are so harsh and the ice is so thick that it would cost too much money. Also, the work season is very short in Antarctica because the only time that workers could do anything would be in summer. In the winter there is very little daylight and transport in and out is difficult if not impossible. Whales - there are a variety of whale species which migrate to Antarctica for the summer. These species include Blue whales, Minke whales, Killer whales (Orcas), Fin whales, Right whales, Southern Bottlenose whales, Humpback whales and Sei whales. The blue whale can grow to a length of over 30 metres long. It is the largest animal ever to have lived. It's much bigger than an elephant and only eats krill. Can you imagine how much krill they would need for just one meal? Whales were hunted almost to extinction in the past, they are slowly recovering though some hunting still continues. Seals - there are plenty of seals in the oceans surrounding Antarctica. They spend a lot of time in the water and nest on the coast. They eat krill, squid and fish. Like whales they were hunted in the past, though not any more and have recovered well. The types of seals found in Antarctica are Fur seals, Crabeater seals, Weddell, Leopard Seals, Ross Seals and Elephant seals. Penguins - there are lots of penguins on Antarctica. The most common is the chinstrap penguin. Other types include Gentoo penguins, Macaroni penguins, rockhopper penguins, King penguins, Adelie penguins and Emperor penguins. Birds - there are more than 40 types of birds which spend summer in Antarctica. These include petrels, albatrosses and skuas. When people began showing an interest in Antarctica, scientists and other environmentalists realised that something would have to be done to protect Antarctica from being exploited and spoiled. In 1959 the Antarctica Treaty which was developed by the united nations and the help of 12 countries was signed. The 12 countries were Argentina, Australia, Belgium, Chile, France, Japan, New Zealand, Norway, South Africa, Russia, the United Kingdom and the United States of America. Other countries joined later on. The main aims of the Antarctica Treaty is to make sure that countries only use Antarctica for peaceful purposes and no military bases are set up. Another organisation which was specially established to look after Antarctica was the Convention on the Conservation of Antarctic Marine Living Resources (CCAMLR) which was created in 1982 to make sure that Antarctica's marine life is protected and over-exploitation does not happen. Over-exploitation is when some animals are hunted to the point where they become endangered. Other environmental organisations which have been looking after Antarctica include Sea Shepherd, and Greenpeace. Ice and snow cover about 98% of Antarctica. The average thickness of ice and snow over the Antarctic continent is about 2,200 metres deep. Antarctica's icecap makes up about 70% of the world's fresh water. If the icecaps were melted the oceans levels would rise to such an extent that the coastal cities around the world would all flood. In winter there are weeks or months of complete darkness depending on how far south you are. In summer there is continuous daylight, 24 hours a day! There is a geographic South Pole which is stable and fixed, there is also a Magnetic South Pole which drifts around, sometimes it is inland, sometimes out at sea. Antarctica has an active volcano called Mount Erebus. This page was adapted from a differentiated curriculum project on Antarctica for a thesis submitted for a Masters Degree in Education at the University of Western Sydney (UWS) by Hadla Trad from New South Wales, Australia.